Inside: Decluttering toys can feel overwhelming, especially if you have a bigger family. 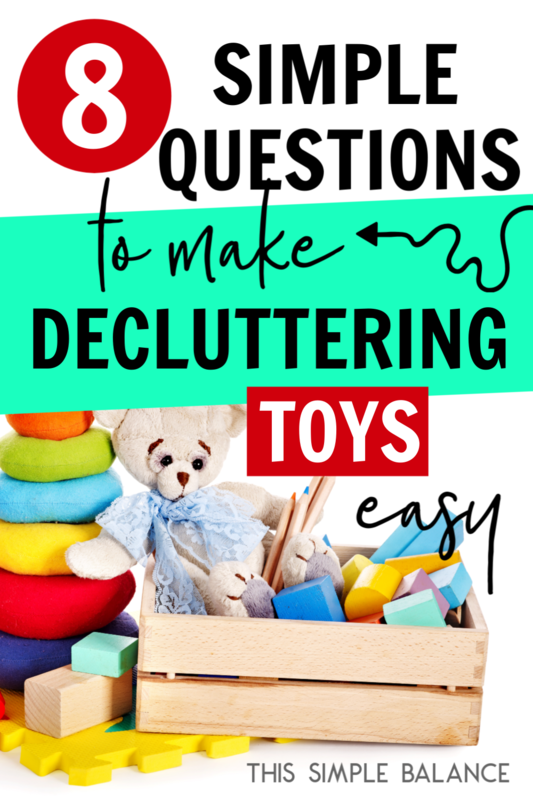 After a lot of trial and error, I’ve come up with eight questions that will make getting rid of toy clutter SO much easier. When you take the plunge into minimalism, many books recommend starting with toys if you have kids. You’ll see a huge difference which will give you the momentum to continue. 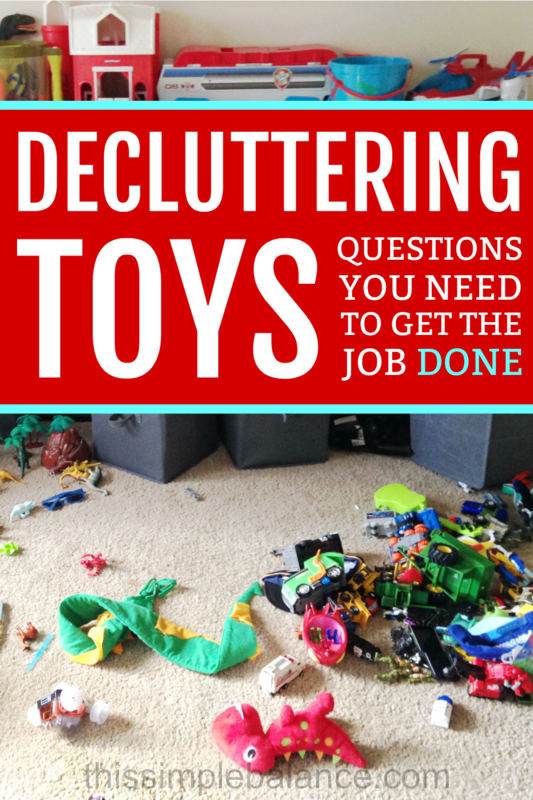 But when you have multiple kids (especially of different genders), decluttering toys can get complicated fast. I started with toys after reading the Life-Changing Magic of Tidying Up, and it was an oh-so-painful process. I debated a long time over things like dolls and Little People and wooden blocks. Hopefully sharing my experience will save you some of the decision fatigue I experienced. I’ll give you the simple questions that I eventually (after much debate) came up with in order to decide what to toss and what to keep. I’ll also show you exactly what remained after we decluttered. Your toy collection will probably look different, but I always find it really helpful to see what other families end up keeping when they finish decluttering toys. I love the book Simplicity Parenting by Kim John Payne. 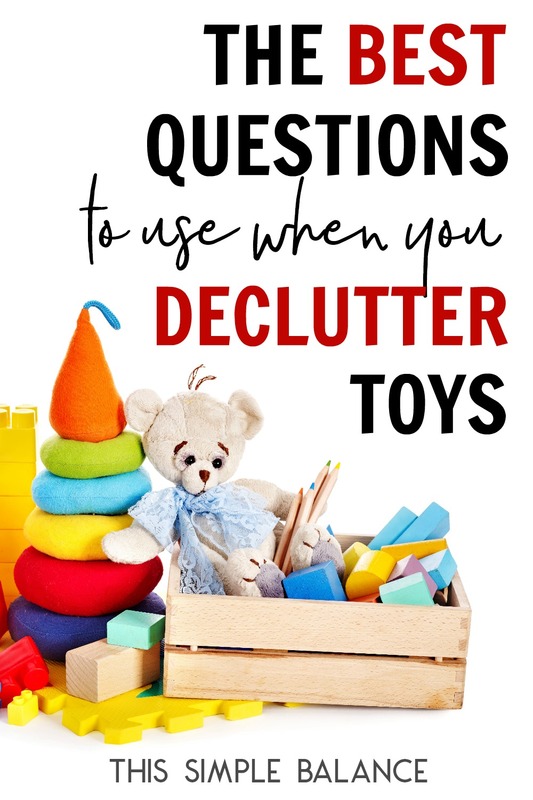 It really helped me to make better decisions about what toys to keep and what to toss. He explains that the fewer toys kids have, and the less specific those toys are, he explains, the better they play. A toy that is too specific forces kids to play with them in one specific way. An electronic robot, for example, can only be played with in a few ways. At the end of day, he’s a robot and is probably not going to become something else in pretend play. Blocks, on the other hand, can be configured several different ways and become a million different things. Decluttering is ongoing process, not an event. When I first read The Life-Changing Magic of Tidying Up, toy after toy (after much debate) went into garbage bags for donation. Broken toys hit the trash can. I listed toys on Craigslist. I practically begged friends to take them off our hands. After the first go around, I felt accomplished. I checked it off my decluttering list and moved on. 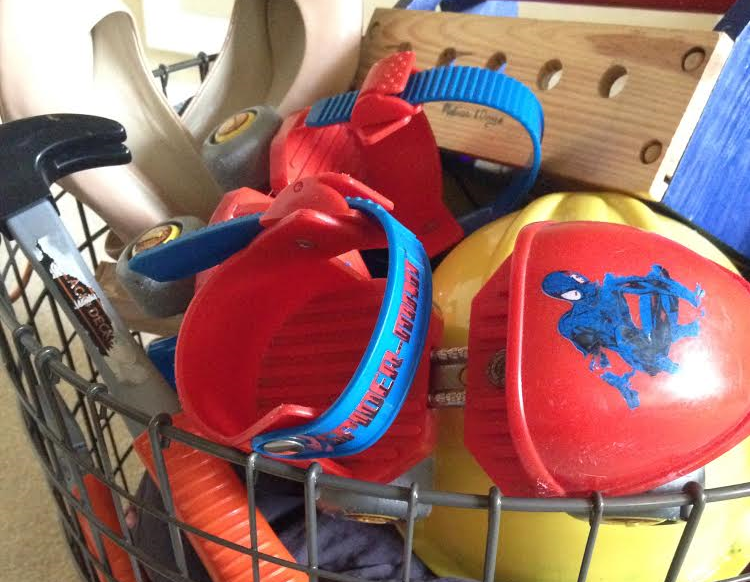 But I quickly realized that when you have kids, decluttering is not a one and done event, but an ongoing process. 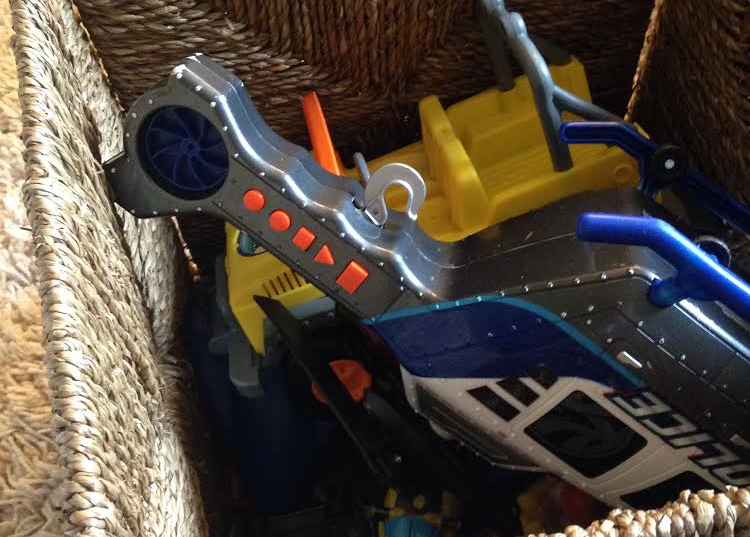 As a mom with multiple kids of both genders, I wrestled with the types of toys to keep. Gradually, I pared our collection down again and again and again. You won’t believe how long I debated over broken toys. Why? Because we spent money on them, or they were given to us by relatives. What some people find rather quirky about Marie Kondo’s decluttering method is her recommendation that you thank an item for its use. I, however, found it extremely helpful. When I felt guilty about getting rid of a certain toy, I remembered how long my kids enjoyed playing with it. That toy didn’t go to waste. We used it and loved it while it still worked. With thankfulness for that time, I finally was able to throw it away or pass it to someone who had the desire and expertise to fix it. 2) Is it frustrating to play with? Simplicity Parenting recommends wooden blocks as an ideal toy for kids. I heard so many moms recommend them that when our neighbor offered us a beautiful set, I eagerly adopted them. Then I expected my kids to instantly love them and play with them for hours. One child would try to build with them, and someone would accidentally bump the tower and done it fell. You can imagine the screams of frustration that instantly pierced my ears. This happened again and again. My other kids played with them for a few minutes but quickly abandoned them. My dream blocks were actually a major flop, but I hung onto them long after I realized it. Why? Because I wanted my kids to love them, which brings me to my next question. 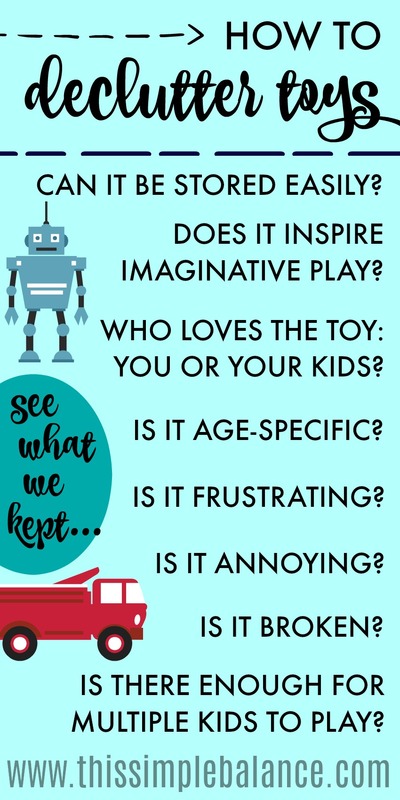 3) Do your kids love the toy or do you? We received this Little People doll house for free. I love doll houses, and again, they are a toy recommended by so many for pretend play. Accompanied by a set of Little People that my daughter received for a birthday present, I absolutely loved it and expected the dollhouse to be a hit. And it was…for a while. The kids eventually abandoned it in favor of blocks or magna-tiles. I had a really hard time giving this toy away because I loved it. Finally, we gave them to a good friend whose has two little girls. They love it and play with it regularly. If you find yourself unable to give up a toy you love, try giving to friends or family who you know will really enjoy it. This category was far easier for me to tackle. Most electronic toys fit into this category with a few exceptions. If a toy drives you crazy, it probably doesn’t belong in your house. What if the annoying toy is a beloved toy? Put it in storage for a while. Assure your child that you will not throw it away or give it away without their permission. After a couple months, they will likely forget about it. I get rid of toys that aren’t asked for if the child is below two and a half years old. After that, I talk them through the process and help them get rid of toys themselves. 5) Does it inspire imaginative play? Like I mentioned earlier, the less specific a toy is, the more likely it is to be played with for extended periods of time. Less specific, simpler toys equals more imaginative play for longer periods of time. Even toys that most parents buy thinking they will encourage pretend play turn out to unnecessary. We got rid of our play kitchen during a recent move and were shocked to see pretend play increase. Observe your kids. What do they play with for a long time? What sparks their imagination? Keep those. 6) Can it be easily stored and cleaned up? I try my best to keep toys that either can be stored in a way that causes minimal mess or store these items in a way that minimizes the mess,that can be easily cleaned up by the kids or myself. You would think that LEGOs and Duplo blocks would not fit this requirement. However, I recently changed the way I making them easier to play with and to clean up (no more dumping!). 7) Is there enough of each toy for multiple kids to play at one time? There’s nothing worse than dealing with sharing battles constantly, especially when you homeschool and have all four kids home at once. When we purchased our magnatiles (we have this set) a couple of years ago, we quickly realized that one set was not going to be enough for the number of kids we had. We ended up adding a set so that everyone could play together well. 8) Is it too age-specific? When you have a big family, age-specific toys need to go as much as possible. We saved three baby toys and three board books for our current baby and future babies. That’s it. If they need replacing later on, it’s only a few items that can easily be found at yard sales or thrift stores. Every other toy in our house (except LEGOs) can be played with by children of any age. Our youngest enjoyed Duplo blocks and magna-tiles long before he could walk. You really don’t need much for the littlest kids. These questions should get you started, but what if you need more help? You could always get a copy of The Life-Changing Magic of Tidying Up. That’s what I did, and it definitely got me started. However, Marie Kondo wrote it before she had kids, and I found some of her advice led me astray in certain areas (don’t get rid of all your linens – you’ll be so sad when the stomach flu hits your entire family! Ask me how I know). I recently read The Joy of Less by Francine Jay, and the recommend it above Marie Kondo’s book. I feel like her book is much more realistic about minimalism (and without all the “Does this bring me joy?” stuff). We were gifted an initial collection of blocks, but you can start with a basic set like this one. 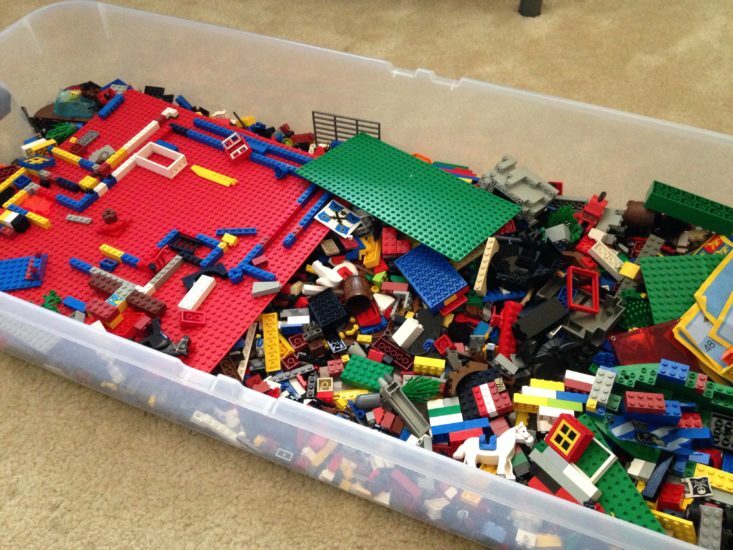 These classic toys are perfect for children of any age, unlike their LEGO counterparts. Because we have such a large collection and our youngest played with them starting around 7 or 8 months, we chose to get rid of the majority of our baby toys. The benefits of playing with LEGOs are too numerous to list here. We recently inherited quite a large collection from my brother, and our kids play and build with them for hours. Certain kids can enjoy sets, but in accordance with the age levels listed, they do take a level of patience to interpret the directions and persevere through the end of the manual. Kids of almost any age, however, can enjoy building new creations from scratch, so long as they have stopped trying to swallow them! 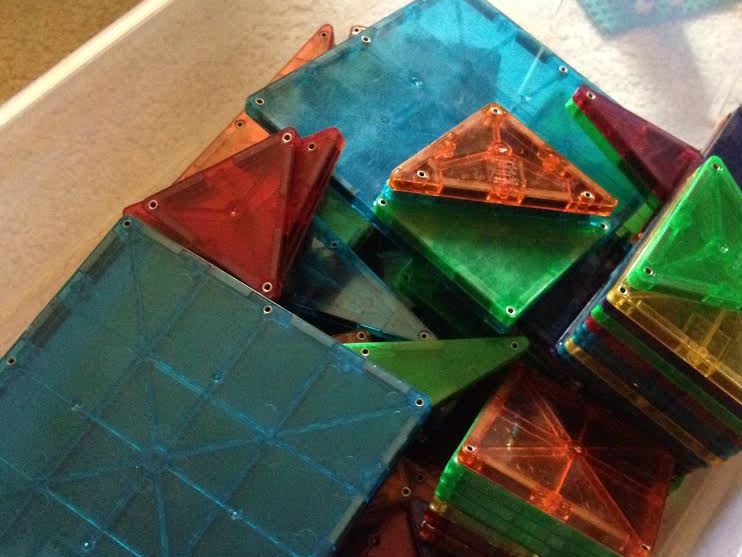 We invested in these magna-tiles last Christmas after seeing them at a friends’ house, and I don’t think we have made a better toy purchase to date. We normally hesitate to spend so much on a toy, but these have been well worth the cost. They play with these tiles almost daily and for extended periods of time. They come up with the most creative ways to use them, as well. Families with one or two children may only need one set, but we quickly saw that one set divided by three kids (and eventually four) left too few tiles to build larger structures. We purchased a second set shortly after getting the first. Balls are a classic toy all over the world. They promote playing together but can easily be used for individual play as well. 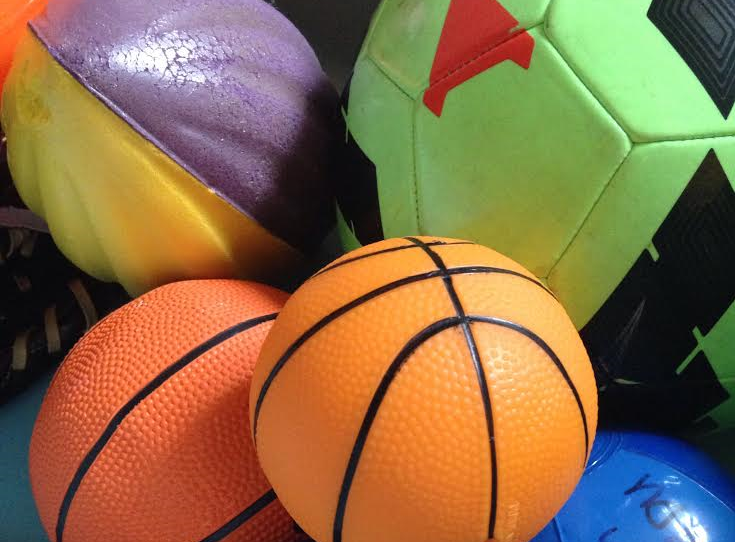 We kept an assortment, from bouncy balls to soccer balls. We also gave Micah this over-the-door basketball hoop for his birthday last year, and we were impressed by its quality and sturdiness. While cars have recently fallen from favorite status, we keep them because they’re classic. One of our kids played with them constantly for several months, carrying around certain ones in his backpack everywhere he went. He played with them like Little People, giving them names and carrying on dialogues between them. 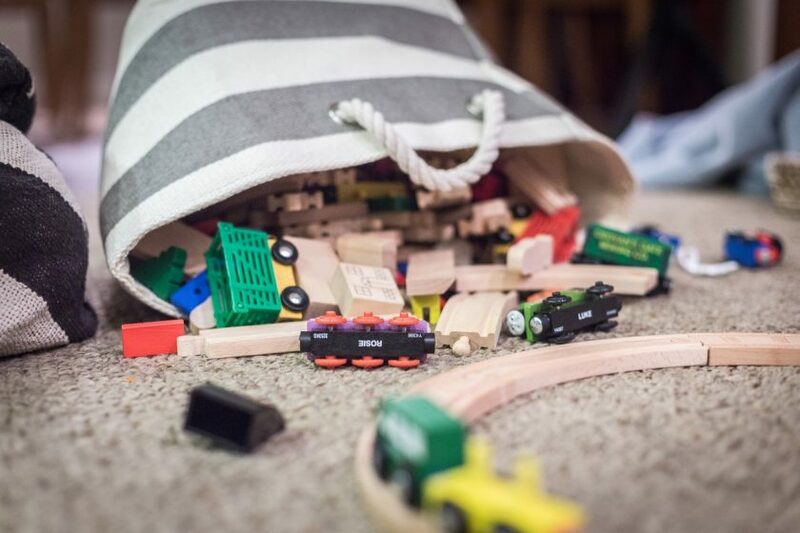 You never know what toys kids will gravitate towards, which is why I recommend a moderate approach to decluttering and minimalism. What childhood is complete without dress-up? We try to steer clear of costumes that restrict their imaginations to one character. So rather than purchase a specific superhero outfit, I keep generic capes and masks instead. Our collection includes an assortment of hats, a variety of accessories such as construction and doctor tools, as well as skirts, scarves, ties, and vests. We recently started storing our dress-up collection and bringing it out once a week. There is so much of it, even with getting rid of so much. When we bring it out once a week, it gets played with so much better and for longer periods of time. We have one girl, so these constantly made the cut, though not without debate. Even boys, however, can benefit from playing with dolls. They could even fit into the dress-up category, really, as all our kids enjoy playing “family” and use these in their pretend play. 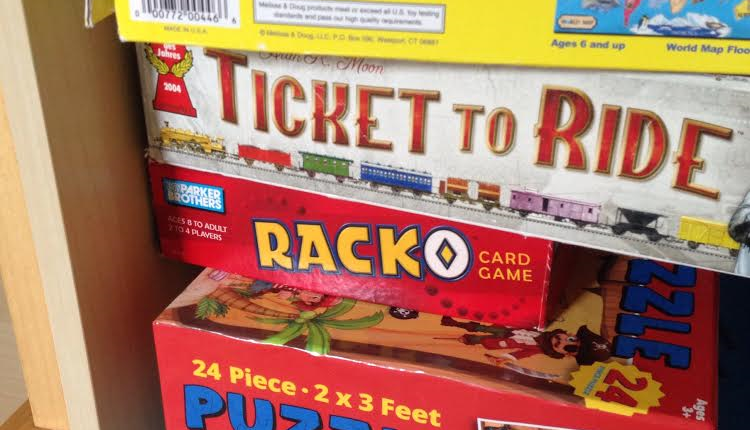 These days, with a toddler in the house, playing board games can be a frustrating challenge. However, I love gameschooling, and one day, the kids will be bigger and more able to play well together. So we continue to add to our board game collection through thrift stores and yard sales. Our current favorites are Minion Memory, Guess Who, and Sorry. I personally love game board boxes and mourn when they break. 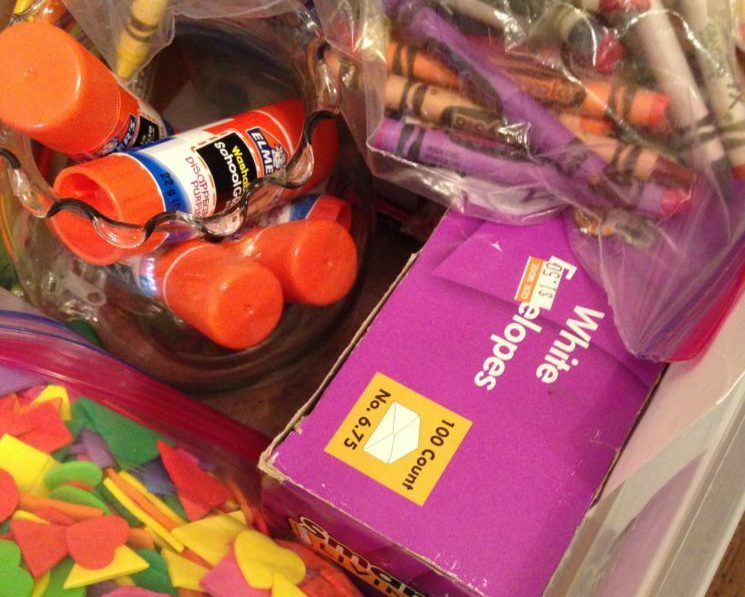 For storage alternatives to boxes, however, check out this idea over at The Intentional Mom. My approach to arts and crafts has changed over the years. I used to have everything under the sun: pom poms, shapes, stickers, pieces of paper, glitter, glue, etc. out and available at all times. After multiple half hour long cleaning sessions, I finally decided my sanity needed a change. Now, I keep one stash of supplies that I only can handle once in a while hidden in a cupboard. Drawing paper (Staples penny paper stocks us year round for pennies) and drawing supplies are easily accessible on the kitchen table. Extras like dot art, scissors, glue, and stickers are kept in a bin close by – out of sight, but easy for the kids to get themselves. Interest in puzzles comes in waves. If I pull them out, they can do the same ones over and over again for hours. 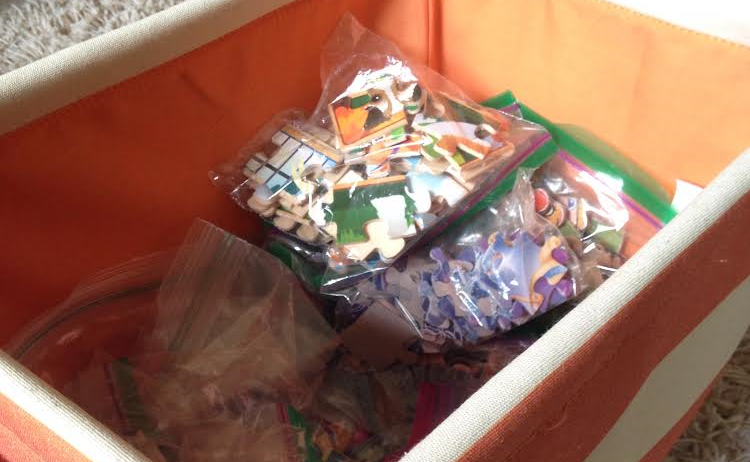 I try to look for wood puzzles like these ones for the little years – our wood ones have lasted several years now. Dollar store cardboard ones? Not so much. I hope to add to our collection over time and look forward to the day when we can all work on one with 1,000 pieces (and not have it destroyed)! As I said at the beginning, what toys you choose to keep is a personal choice based on you and your kids’ personalities. Hopefully, our collection gives you a starting point and inspiration to declutter your toys. Minimalism can seem off-putting at times because some people take it to extremes. But as my blog name communicates, I’m all about balanced simple living. Don’t be afraid to go down the path to minimalism because of extreme examples. You don’t need to follow anyone else’s rules. Embrace the general principles, and examine your own circumstances. Take what you need; leave the rest. Thanks for the questions in regards to what toys to keep. We are going to be downsizing so I need to go through the kid’s toys. These questions will definitely come in handy! So glad you found it helpful, Julie! Good luck decluttering toys. Oh, the too-specific-age toys have been getting me lately! We got some beautiful baby toys for our first (a four-ring wooden stacker? Those wooden Melissa and Doug chunky puzzles?) that get played with from about 10 months old to 14 months old. How silly to keep them year after year! This is great food for thought! I’m curious what you have found to be good starter board games for younger kids. I have good memories of playing family games growing up, but I’m not sure how to start and I find all the pieces overwhelming. Chutes and ladders and candyland are great just for teaching how to follow rules and be a good sport when you get sent back. They also don’t require skill, so anyone can win. Guess who is great for teaching logic. We LOVE Hisss (https://www.amazon.com/Gamewright-5219-Hisss-Card-Game/dp/B00005NQE8) for young kids. Even my barely-2-year-old can play it with us fairly easily. and cleanup is breezy because it just has one kind of card.